If you thought construction on I-95 was coming to an end, it may be time to think again. The Florida Department of Transportation (FDOT) is considering expanding I-95 between Downtown and Southpoint to as many as 10 to 15 lanes. 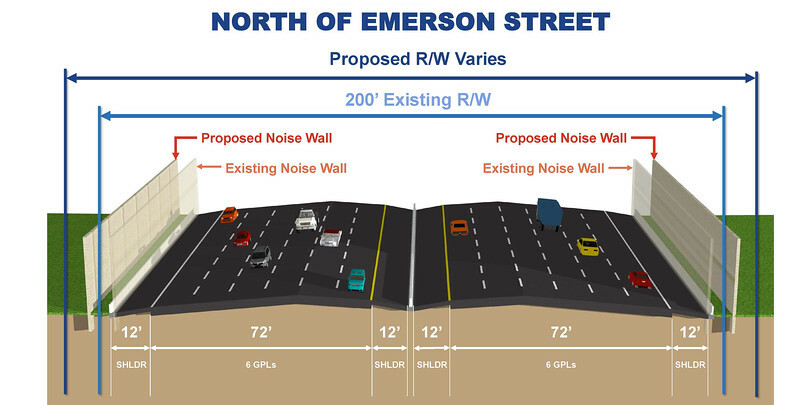 Here's a few graphics at what I-95 could look like if these improvements are made. FDOT is currently studying the prospect of Express Lanes on I-95 between J. Turner Butler Boulevard and Atlantic Boulevard. The study suggests two Express Lanes northbound and two Express Lanes southbound. These tolled lanes, if constructed, will add capacity to the roadway and offer drivers a choice in their commute. This segment of I-95 experiences peak period congestion due to demand that exceeds the roadway’s capacity. 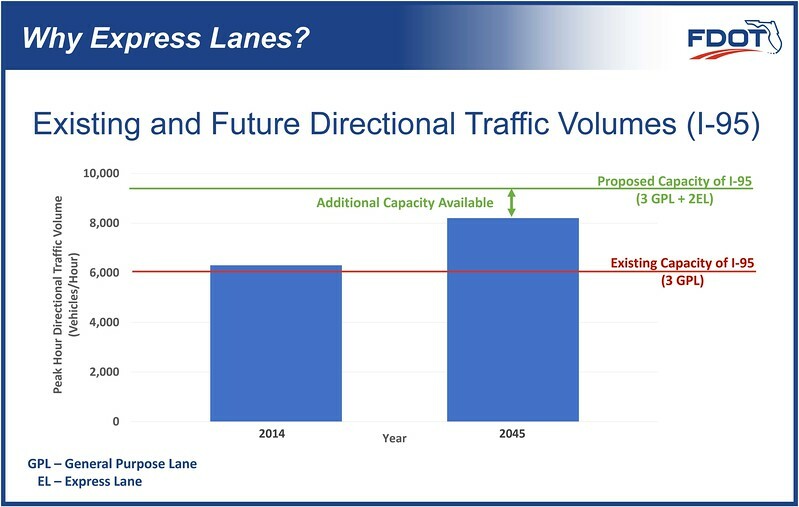 With expectations of continued traffic congestion, the purpose of this PD&E study is to evaluate the addition of Express Lanes in order to provide capacity improvements and relieve congestion. Express Lanes are an innovative concept to manage traffic congestion and provide choices for motorists. These additional lanes will provide more capacity in areas where traffic congestion is a concern. The study will also examine all interchanges regarding safety and operational improvements. 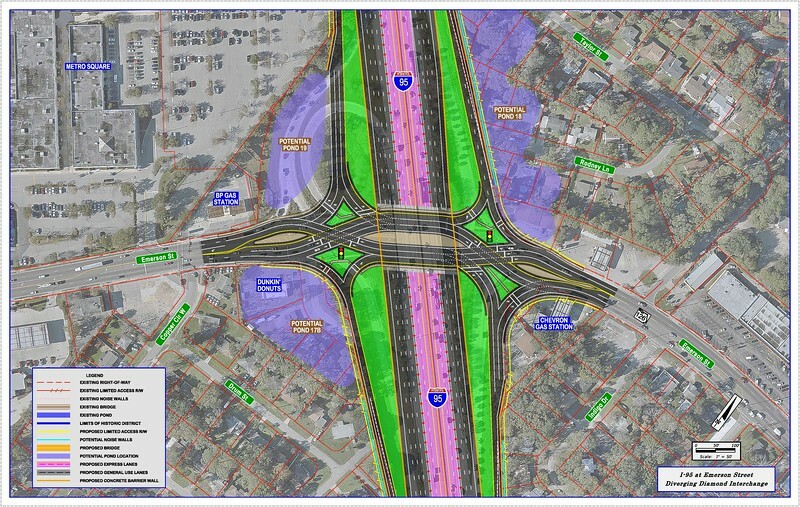 I-95 at Emerson Street would be redesigned into a Diverging Diamond Interchange. Potential locations for stormwater ponds could result in the loss of several commercial properties and residences along Rodney Lane and Copper Circle. 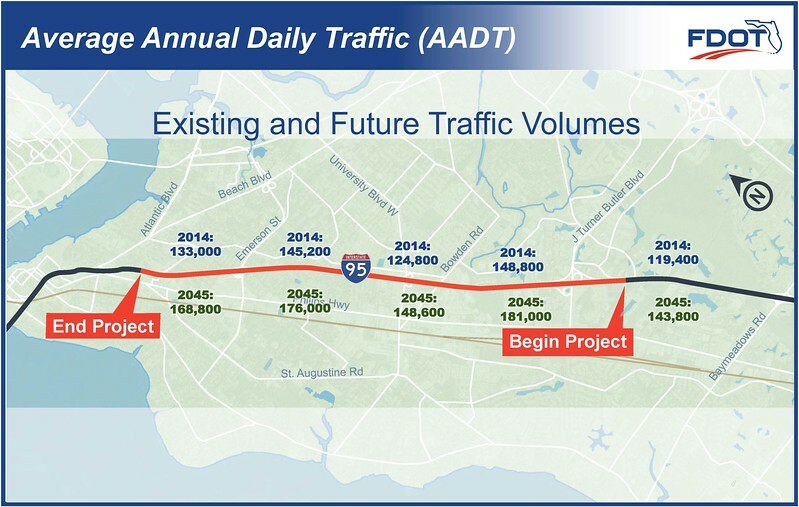 As proposed, I-95 would be widened between 10 to 15 lanes wide between Bulter Boulevard and Atlantic Boulevard.